Beneath that glorious mass of writhing tentacles is a tiny sea slug getting on with his/her hermaphroditic day. 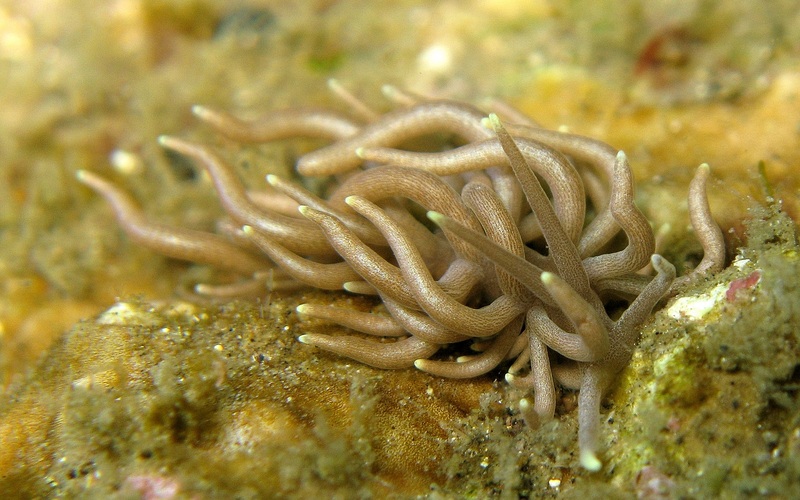 It's Phyllodesmium briareum, a kind of aeolid nudibranch from southeast Asia. A big one is a mere 2.5 cm (an inch) long, others are less than half that. P. briareum spends the day feeding on various kinds of soft coral, but they also have a whole other food source at their disposal. If you look closely, you can see a kind of stripy, woodcut pattern on the slug's skin. These are single-celled plants called zooxanthellae, which live in specialised ducts in the digestive gland. They do their photosynthesis thing and provide sugars for P. briareum, and in return they get a safe place to live. Would you have thought P. briareum is a master of mimicry? Their specific name briareum comes from Briareos, one of three Greek storm giants who each had one hundred hands and fifty heads. Can you imagine that? So long as they were all of one mind, they could get so much done in a day! It'd be terrible if there were disagreements, though. I have enough trouble actually DOING the things I want to do - and REALLY wanting to do the things I think I SHOULD want to do - without outright factionalism and political intrigue going on among my heads. 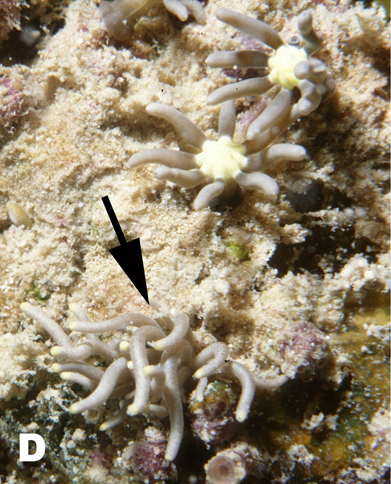 Anyway, P. briareum doesn't look all that much like a storm giant, but they do look a lot like a soft coral of the genus Briareum. Specifically, Briareum violacea, which is just the kind of coral it might eat. Rude! 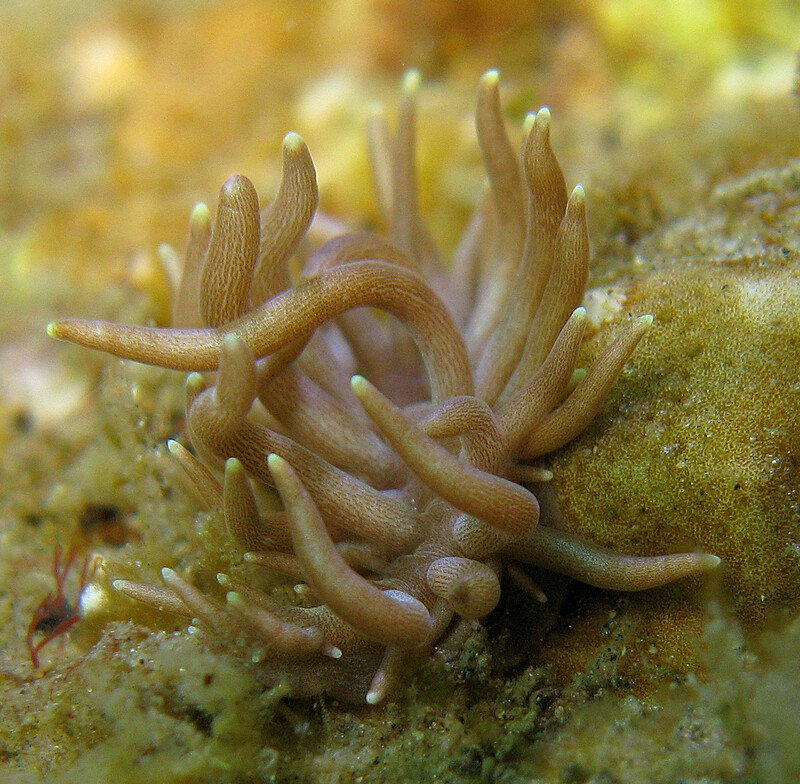 Most aeolid nudibranches are able to swallow the stinging cells of corals, sea anemones or jellyfish and move them into special sacs at the end of their cerata for use in defence. 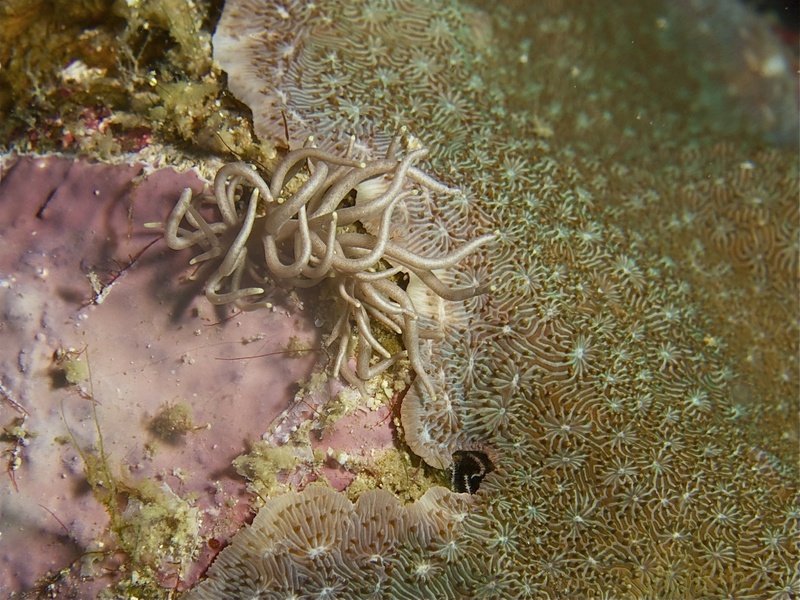 P. briareum doesn't do this because the stings of the soft corals they eat aren't particularly impressive. Instead, their cerata end in glands that produce horrible sticky stuff to deter predators. The cerata can even drop off and wriggle around, hopefully distracting assailants for long enough for the slug to escape. Hey, look! It's an army of sticky worms! In his house in Asia dead Briareum waits dreaming! Ha! I'm totally up for the Cult of Briareum! It's what the world truly needs! Any critter that chooses their prey item as their camouflage gets bonus awesome points from me! Haha! True! You can eat them and then replace them, no-one's any the wiser! One of nature's true wolf-in-sheep's-clothing scenarios!